According to research by independent citizens like “Donald Duck, Esq”, CLICO and associated sub-entities haven’t filed their bookkeeping accounts and are now 9 months past due. That’s actually just following the old pattern established when David Thompson was CLICO’s lawyer in the days before he became our Prime Minister. Consider this folks: CLICO filed it’s 1993 financial statements in 2006 so the monkey-business has been going on for a long, long time. The events surrounding CLICO, parent company CL Financial and all the other associated entities are, thus far, the scandal of the century – but you’d never know that by reading the Barbados news media where “investigative reporting” is confined to regurgitating government press releases. 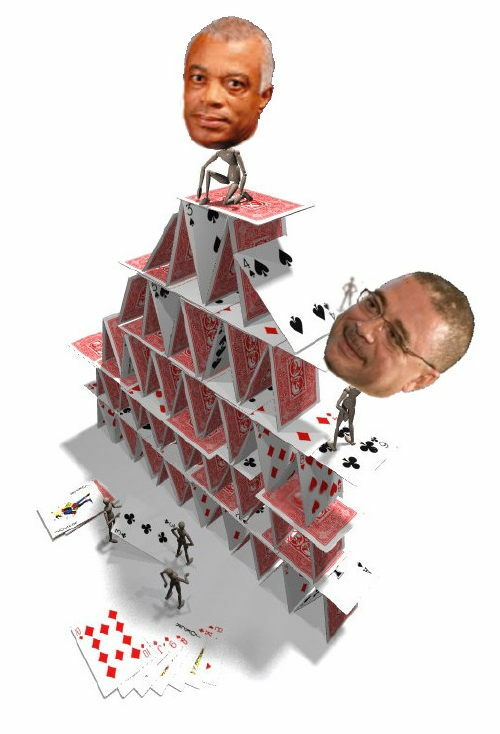 Both The Nation and The Barbados Advocate newspapers continue to sanitize anything they write about the CLICO – CL Financial mess – and neither paper asks any questions. Oh… the papers do continue to print adverts for CLICO and receive payments for the same. Golly… do ya think that the advertising revenues are connected with the absence of real reporting on the CLICO story? Nah… couldn’t be. The journalists and editors of the Barbados news media are far more ethical and professional than to kill a story for advertising revenues… aren’t they? As to the reason why the Caribbean Broadcasting Corporation (CBC) doesn’t do any in-depth investigative reporting on CLICO or CL Financial, I’m sure it’s just an oversight that has nothing to do with the fact that CLICO big guy Leroy Parris is in charge at the CBC thanks to his friend Prime Minister David Thompson. The CL Financial – CLICO scandal is huge and the people of Barbados deserve better from their news media than they have been getting. C.L. Financial’s assets vanished into thin air – $100.7 billion down to $23.9 billion in just 12 months! There were phony shell companies, executives who took bribes to have the company purchase land in Florida for more than its real value and on and on and on. When compared to the CL Financial – CLICO scandal, Sir Allen Stanford looks like a kid who pocketed a sweet without paying – but until the Barbados news media decides that they serve the public interest, Barbados citizens will continue to be kept in the dark about how much of their money went missing, where it went and who profited from their losses. CLICO filed it’s 1993 financial statements in 2006 so the monkey-business has been going on for a long, long time. So what? GEMS filed? Any other Government body filed? This is incorrect since if the due date for filing the accounts I mentioned was april 30, 2009, they are only coming up to being 9 months being in arrears and not two years. The 2007 financials were already released. So let’s be fair. BFP, can you change your article please? Blogs come through again when the readers crosscheck! “So what? GEMS filed? Any other Government body filed? de money gone gone gone!!! BFP changed the article to reflect the 9 months overdue instead of 2 years for the Clico accounting. The problem remains that Thompy gave our money to Clico without getting an accounting first. Now what? This is old news, everybody in this island is corrupt in one way or another anyway, so what is new!!! When dey gonna lock de doors. PORT OF SPAIN, Trinidad, January 21, 2010 – Another CL Financial top executive is leaving the embattled company. Group Financial Officer Michael Carballo has handed in his resignation, just a week after chief executive officer Steve Bideshi said he was leaving at month end. Carballo’s resignation also takes effect on January 31st, according to a statement issued by the company yesterday. However, he will remain on the CL Financial Board of Directors. He has been replaced by Winston Millet with immediate effect. In January last year, the Patrick Manning government announced that it was stepping in to assist the conglomerate, which has CLICO and British American Insurance Company Limited among its holdings, when it found itself facing major liquidation challenges. This is inaccurate..get Donald Duck Esq to check again. The statements were published in the press in early December if I recall…Clearly we are becoming here like the regular media..giving half the information on poor research…. Ah gine to the meeting this evening and ask John Boyce some questions about his stewardship. Ah Know he was once a Brewer so ah dont know how he gine respond to Why No Breathalyser Testing. Me family had to hold them belly fah mah nephew who was literally assasinated by a drunk drinker using a car as a weapon. Up to now ah still having nightmares of the brek up leg wid the bones protruding, punctured lungs and bulging eyes from a swollen brain! Oh… so the statements were only 8 months late instead of 9? Have ALL the CLICO companies and subsidiaries now filed their financial statements or is it only Clico Mortgage and Finance Corporation? Why weren’t the statements filed on time to begin with? Were they audited? What’s the story on CLICO’s investment in the Florida land where bribes were paid… how much of that debt are the taxpayers of Barbados on the hook for? I may have missed the publication of clico mortgage and finance!! Please let me know the date they were published and the publication. However what matters most here is clico life. clico mortgage and clico general already have buyers. I thought BFP was about being fair and and unbiased .it almost seems like you guys just are enjoying the sensationalism this might bring to the blog rather than do the same Investigative research and fair analysis on this issue as you are accusing CBC for being unable to. Isn’t the Government through the National Insurance also propping up Sagicor through that recent private placement of shares that they did that was almost solely to the National Insurance…? has Donald Duck esq been analysing and researching that one as well???? With all of the major investments Sagicor made into the slumping Jamaican economy over the last few years how safe are our pension funds? Are any of you guys over there asking these questions or even concerned..doesn’t Dodridge Miller owe the public some “clear” explanation of Sagicor’s true position? What about Mr. Carrington over at NIS for taking our money and putting it in there was this really a sound investment? Where’s the Opposition leader on that issue? Has anyone looked into the state of Sgaicor’s statutory fund? Come on..we need to look at the big picture here..Clico’s trouble are already in the open and hopefully being fixed are we gonna let another bombshell sneak up on us? Come on guys where’s the balance? Let’s not become like the mainstream media…. Chairman, you sound like you know something about Clico and big companies like that. BFP ask if all of CLICO’s subsidiaries have filed their paperwork by this time. I cannot speak for any of the companies. Just like BFP I have followed the matter with some interest in a general way. I am not certain that the other companies have I just recall seeing the audited statements for the Mortgage company. I also checked further..it seems that approximately $40 Million dollars of NIS funds went to Sagicor. What would be really interesting is if the private placement was engineered by the Government for the NIS to finance Sagicor’s acquisition of Clico Life directly (or certain pension and life insurance portfolios within Clico Life). That would allow Sagicor to expand their business with easy money whilst also saving Mr. Thompson from having to put Clico Life under administration. I really would not rule anything out at this stage. the difference here between sagicor and clico life is that sagicor is up date with the release of the financials, clico appears not to be unless you can say and prove otherwise. Why is it that clico has also been silent on mr parris’s retirement. Even though an announcement of this was made some onths ago why is it that the press and or clico said anything about his retirement on dec 31. I understand that the 2008 financials for clico life have now been released. could someone publish them on the net. As interesting as Barbados Politics has always been (forgotten Tom Adam days and such), it is not very surprising the current environment of the financial sector, and then some. Seems to me like to many hands are sitting in on a game of monopoly at the expense of Barbadians, and also Caribbean national. Along with golf courses, lifestyles and mentalities we have regrettably also adopted the cookie cutter principles of the Spirit of Capitalism and the in fashion craze for development above and beyond any means. What does it take to get these little puddles of rock on the map? Known by the world and praised by all? It takes risks, and it takes money, someones’ money. Let’s face it, the Ryan Brathwaites and Rhiannas cannot get us in the spot light, not with the economic giants at least. Every gambler knows that this maybe the day his luck out, but that’s half the fun right?! Especially when you have immunity from the hang man. PS: The people elect individuals, bodies, and committees to represent their best interest, whether a political office or a CEO, their have to give a stamp of approval before the person can be that voice. What happens when you give the voice the power to do all it desires? Yes, Crook is the correct spelling. What about the financial statements for british american insurance? When will their building on collymore rock be completed?